NOTE: You are purchasing a standalone product; MasteringA&P does not come packaged with this content. If you would like to purchase both the physical text and MasteringA&P search for ISBN-10: 0321981227 /ISBN-13: 9780321981226. That package includes ISBN-10: 0321981227/ISBN-13: 9780321981226 and ISBN-10: 0133983412/ISBN-13:9780133983418. Human Physiology: An Integrated Approach broke ground with its thorough coverage of molecular physiology seamlessly integrated into a traditional homeostasis-based systems approach. 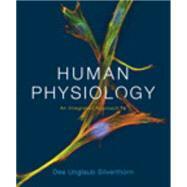 The newly revised Seventh Edition includes new Phys in Action! Video Tutors that are accessible from the text and a wide range of engaging activities in MasteringA&P that are designed to bring the textbook to life, including new Interactive Physiology 2.0 Coaching Activities, Phys in Action! Coaching Activities, and Dynamic Study Modules. MasteringA&P is an online homework, tutorial, and assessment program designed to work with Human Physiology: An Integrated Approach to engage students and improve results. Within its structured environment, students receive hints and wrong-answer feedback to practice what they learn, test their understanding, help them better absorb course material, and grasp difficult concepts. Dee Unglaub Silverthorn studied biology as an undergraduate at Newcomb College of Tulane University, where she did research on cockroaches. For graduate school she switched to studying crabs and received a Ph.D. in marine science from the Belle W. Baruch Institute for Marine and Coastal Sciences at the University of South Carolina. Her research interest is epithelial transport, and most recently work in her laboratory has focused on transport properties of the chick allantoic membrane. Her teaching career started in the Physiology Department at the Medical University of South Carolina but over the years she has taught a wide range of students, from medical and college students to those still preparing for higher education. At the University of Texas-Austin she teaches physiology in both lecture and laboratory settings, and instructs graduate students on developing teaching skills in the life sciences. She has received numerous teaching awards and honors, including a 2011 UT System Regents’ Outstanding Teaching Award, the 2009 Outstanding Undergraduate Science Teacher Award from the Society for College Science Teachers, the American Physiological Society’s Claude Bernard Distinguished Lecturer and Arthur C. Guyton Physiology Educator of the Year, and multiple awards from UT-Austin, including the Burnt Orange Apple Award. The first edition of her textbook won the 1998 Robert W. Hamilton Author Award for best textbook published in 1997—98 by a University of Texas faculty member. Dee was the president of the Human Anatomy and Physiology Society in 2012—13, has served as editor-in-chief of Advances in Physiology Education, and is currently chair of the American Physiological Society Book Committee. She works with members of the International Union of Physiological Sciences to improve physiology education in developing countries, and this book has been translated into seven languages. Her free time is spent creating multimedia fiber art and enjoying the Texas hill country with her husband, Andy, and their dogs.